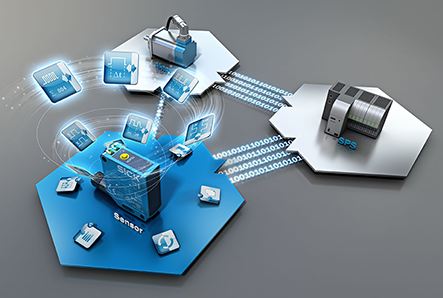 This is a guest post by Comtrol Corporation, a provider of networking and industrial data communication products, specializing in industrial Ethernet and device connectivity. Comtrol has also been designated as the North American IO-Link Competency Center. You may be hearing a lot of buzz about IO-Link lately, but do you know what it is or how it works? Below are the answers to common questions about IO-Link technology, what it does, who can benefit from it, and more. IO-Link is a standardized, bi-directional communication protocol supported on sensors or actuators, which are connected through a master. This gives the user/integrator more information about their devices and allows them to have remote access, which fits into the hot topic of Industrial Internet of Things (IIoT) or Industry 4.0. IO-Link is a complimentary technology to an existing PLC, HMI or other controls architecture. What IO-Link is Not: IO-Link is not another fieldbus. Rather, it was developed to reduce dependability on fieldbus support by manufacturers and users alike. It is designed to be as simple and universal as possible, requiring only standard M12/M8/M5 cables (no special cabling or connectors). It is also not a proprietary communication protocol, but rather a recognized international standard (IEC 61131-9). 2. How Is an IO-Link Sensor Different From a Standard IO Sensor? Compared to a standard IO sensor, a sensor with IO-Link allows the user to see much more data about the sensor and even allows the ability to change the sensor’s settings without having to stop a manufacturing or production line to access the individual sensor. With an IO-Link sensor, you are also able to store parameters or settings inside of a master block, such as Comtrol offers, which can then be loaded to a brand new, factory-default device if necessary. 3. What Kind of Data Can You See with IO-Link? With IO-Link, you can see the manufacturer information and part number, among other data, of your sensors that are connected to the master block. So, if a sensor needs replacement but the lettering of the manufacturer or part number has rubbed off or become illegible, you can quickly see the exact model that needs to be replaced with this information already built in with IO-Link. This is also called Service Data, information that is not relative to a device’s function but rather about the device itself. 4. What Kinds of Settings Can Be Changed with IO-Link? A user can change the settings of an individual sensor without stopping the line to manually change sensor settings one-by-one. With a web interface for instance, the user is provided access to these settings remotely. One of the most common uses of this capability is to change the read ranges of the sensors for product changeover. For example, if a manufacturer is producing “Product A” and “Product B” on the same line and needs to change sensor settings in-between the processes, this can be achieved by storing parameter sets in the PLC and then sending them out through the master block to sensors when a change is needed. The result? With IO-Link there is a potential for drastic reduction in downtime. 5. What is an IO-Link system comprised of? An IO-Link system consists of IO-Link sensors or actuators and an IO-Link master block. 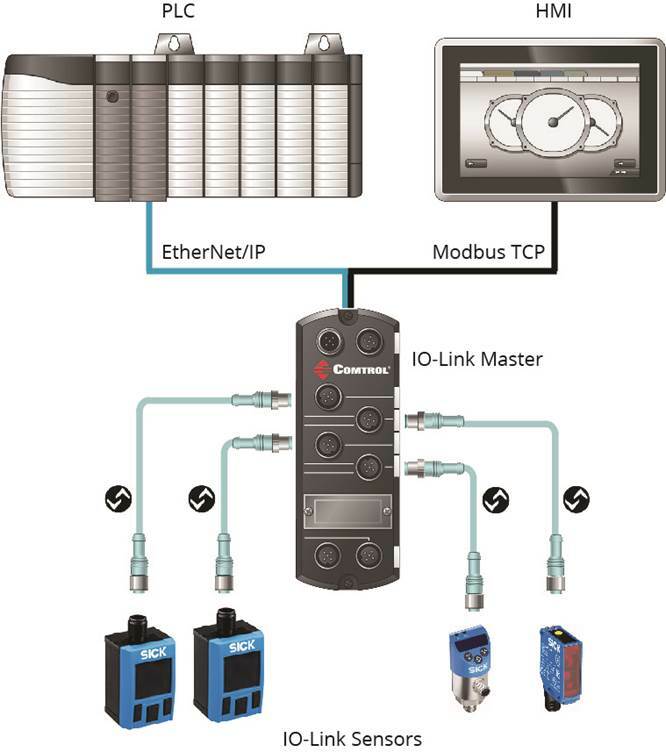 The information from an IO-Link device is communicated through an industrial Ethernet protocol, most commonly EtherNet/IP, PROFINET/IO, or Modbus TCP. The user can then access the sensor-level information and change sensor data remotely via the embedded web interface, PLC, HMI or other controller. 6. Do I need a PLC to use IO-Link? It depends on your industry and application. For example, Comtrol worked with one systems integrator in the mining industry that did not have a PLC present for a project. Instead, they used a connected PC to access sensor-level data from their presence detection IO-Link sensors. This allowed them to remotely view the results of the sensors checking for the presence of minerals. 7. What are the Key Benefits of IO-Link? IO-Link has three primary benefits: remote accessibility, auto-device replacement, and diagnostic capability. All of these key features of IO-Link contribute to reducing costly downtime, generally at manufacturing or production plants, and also gives the user much more information about their sensors or actuators. Remote Accessibility refers to the capability to access sensor-level information and make changes from anywhere, as long as the user is able to connect to the master and/or a network. Auto-Device Replacement refers to IO-Link’s data storage feature that allows the user to download an old sensor’s data into a new sensor for seamless device replacement. This means that the new sensor can be quickly installed with all the settings of its predecessor, which ensures the line can be up and running in a timely manner. Diagnostic Capability refers to the ability to see errors and other important information without having to stop the entire line to investigate the problem. For example, in material handling applications, a problem with a sensor would traditionally mean shutting down the system so that a person can access it and manually troubleshoot and make changes to the device. With the ability to see error codes or other events through the web interface, the user can quickly identify which sensor is malfunctioning and what the problem is. No line shutdown required. 8. What Industries Are Adopting IO-Link Technology? Key industries that Comtrol is seeing use IO-Link include automotive, material handling, manufacturing, food & beverage, and many other industries, especially those that experience frequent changeover or typically long downtime. 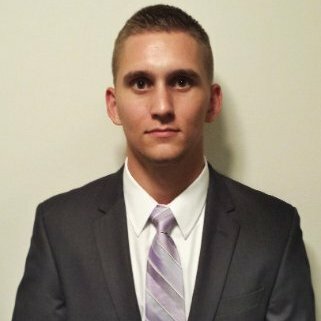 Brandon is an Industrial Automation Account Manager at Comtrol Corporation.